35001001 ZX8-2 HITACHI ZX8-2 Crawler excavator. Spare Parts Catalog. Service (workshop) Manual. Operator's Instruction Manual. 35001002 ZX8U-2 HITACHI ZX8U-2 Crawler excavator. Spare Parts Catalog. Service (workshop) Manual. Operator's Instruction Manual. 35001003 ZX10U-2 HITACHI ZX10U-2 Crawler excavator. Spare Parts Catalog. Service (workshop) Manual. Operator's Instruction Manual. 35001004 ZX17U-2 HITACHI ZX17U-2 Crawler excavator. Spare Parts Catalog. Service (workshop) Manual. Operator's Instruction Manual. 35001005 ZX17UNA - 2 HITACHI ZX17UNA-2 Crawler excavator. Spare Parts Catalog. Service (workshop) Manual. Operator's Instruction Manual. 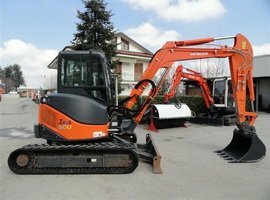 35001006 ZX22U-2 HITACHI ZX22U-2 Crawler excavator. Spare Parts Catalog. Service (workshop) Manual. Operator's Instruction Manual. 35001007 ZX30U-2 HITACHI ZX30U-2 Crawler excavator. Spare Parts Catalog. Service (workshop) Manual. Operator's Instruction Manual. 35001008 ZX30UR - 2 HITACHI ZX30UR-2 Crawler excavator. Spare Parts Catalog. Service (workshop) Manual. Operator's Instruction Manual. 35001009 ZX35U-2 HITACHI ZX35U-2 Crawler excavator. Spare Parts Catalog. Service (workshop) Manual. Operator's Instruction Manual. 35001010 ZX35U - 2 - DH HITACHI ZX35U-2-DH Crawler excavator. Spare Parts Catalog. Service (workshop) Manual. Operator's Instruction Manual. 35001011 ZX40U-2 HITACHI ZX40U-2 Crawler excavator. Spare Parts Catalog. Service (workshop) Manual. Operator's Instruction Manual. 35001012 ZX40UR - 2 HITACHI ZX40UR-2 Crawler excavator. Spare Parts Catalog. Service (workshop) Manual. Operator's Instruction Manual. 35001013 ZX50U-2 HITACHI ZX50U-2 Crawler excavator. Spare Parts Catalog. Service (workshop) Manual. Operator's Instruction Manual. 35001014 ZX50U - 2 - DH HITACHI ZX50U-2-DH Crawler excavator. Spare Parts Catalog. Service (workshop) Manual. Operator's Instruction Manual. 35001015 ZX55UR - 2 HITACHI ZX55UR-2 Crawler excavator. Spare Parts Catalog. Service (workshop) Manual. Operator's Instruction Manual.